In her as role as Senior Marketing Content Strategist, Tara drives the creation of resources to promote Mediacurrent as a thought leader in the technology space. She thrives on the small business imperative to work smart through strategic marketing automation, digital marketing, and creative brand building. 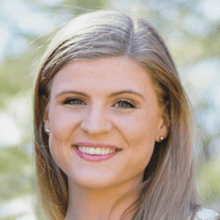 Prior to joining Mediacurrent, Tara spent five years sharpening her inbound marketing skills in the higher education technology and publishing industries. Her specialties include inbound marketing, event marketing, webinars, blogging and marketing automation. She holds a BA in Communications (Public Relations focus) and minored in creative writing.